Its fall and Pumpkins is on everyones mind. But many forget about the benefits of Pumpkin Seed Oil. Pumpkin seeds are packed up with essential fatty acids, vitamins, minerals, antioxidants and many more. Pumpkin Seed Oil is often known as the “superhero ingredient” in skincare products due to its richness in zinc, vitamin E, vitamin C, antioxidants, and omega 3- and 6- fatty acids. . Pumpkin seed oil has the ability to hydrate the skin but not leave an oily residue – leaving your skin looking fresh and clean.The oil from these pumpkin seeds helps soothe, hydrate, protect and even to renew your look, making it a great ingredient for anti-aging formulas. Anti- Aging - PSO has potent antioxidants that battle free radicals throughout our body. Loaded with vitamin E, which protects our skin cells from oxidative damages which giving the skin a young and beautiful appearance. The oil comes packed with vitamins, minerals and essential fatty acids, which also contribute to its anti-aging capacities. Effective on oily skin – the zinc in these pumpkin seeds along with natural selenium helps oily skin to look much more healthy and clean. 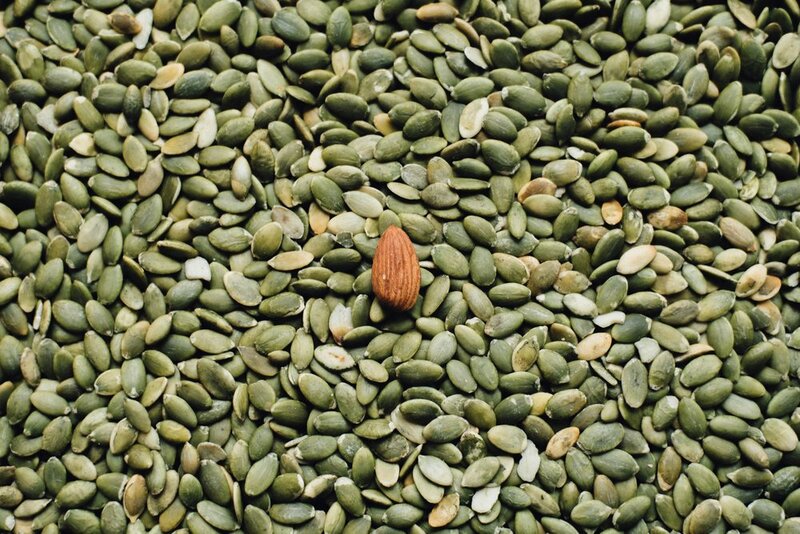 Rich in Antioxidants – a pumpkin seed is a rich source of Vitamin E, which is also a great antioxidant. Therefore, PSO helps to protect skin from environmental stressors. Deeply moisturizes the skin – the great key essential fatty acids in pumpkin seeds incline deeply onto the skin to provide a long lasting moisturization without any greasiness. Regenerates Cells - There are very few natural ingredients that can promote our cell turnover as efficiently as pumpkin seed oil does. PSO contains natural alpha hydroxyl acids, which give us radiant and youthful look by facilitating exfoliation and encouraging cell regeneration. Other nutrients like polyunsaturated fatty acids, vitamin E and zinc also make it an excellent solution for premature aging, dehydrated skin and cell renewal. We have several serums that contain PSO to keep your skin looking radiant all year round. Our No. 30 Botanical Facial Cleansing Oil and No. 42 Blue Tansy + Watermelon Seed oil contains this amazing oil and if you want to change the look of your skin. Please take the opportunity to purchase one of our serums to change the look and feel of your skin.